Steinway Piano Model B 6’10.5″ 1981, New hammers, shanks and knuckles. All cloth bushing, no teflon. Magnificent Steinway sublime tone and action response. One owner, lightly played. Piano excellent inside and out. Steinway B’s are considered by many to be the most sought after piano in the world. Perhaps the flagship of the Steinway Pianos. The design and craftsmanship that goes into a Steinway B is second to none. Questions? Call sonny Direct at 631 475-8046. High Gloss Ebony Young Chang about 12 years young. Like new condition. Rarely played served as a furniture piece. Our technicians and furniture people just went over it with a fine tooth comb. Ready to go. Questions? Call Sonny Direct 631-475-8046. Free LI/NYC delivery all else continental USA $475. Warranty. 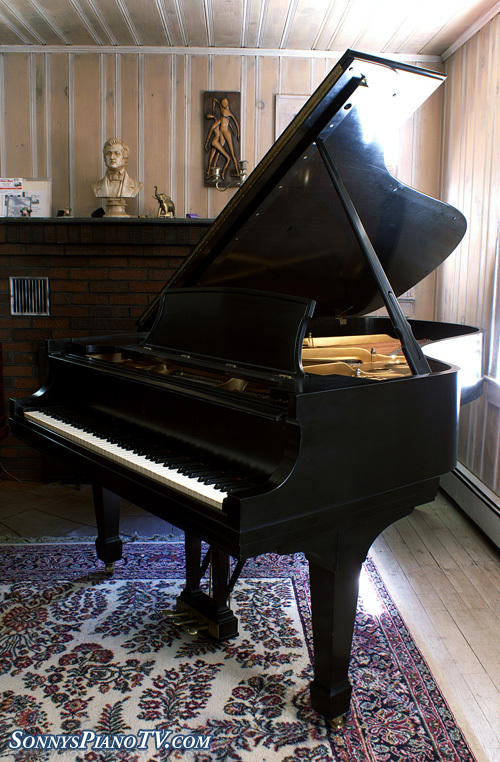 Steinway Piano Model M 1927 Complete Rebuild & Refinish $23,500. Steinway Parts! Magnificent Steinway Model M total rebuild, all new parts, new soundboard, pin block, Steinway hammers, shanks, knuckles, keytops, wippens, action parts, dampers, strings, pins bushings, hand rubbed satin finish. All work done just a couple of years ago. Piano not sold or used since then. We were keeping this gem on the shelf. New M’s go for around $55K.. some would say this is better then a new one. Most Steinway aficionados will also tell you that the pre-WW2 Steinways are better then the ones made today as the cast iron plates were made in the Steinway foundry which they stopped doing after 1945. Another reason is that the wood came from older trees so the wood was thicker, more dense and better for making an instrument. This is one of the reasons why the Stradivarius violins are still considered the world’s best even though they are 300 years old. Questions? call sonny Direct at 631 475-8046. Warranty and Free LI/NYC delivery. All else continental USA only $475. 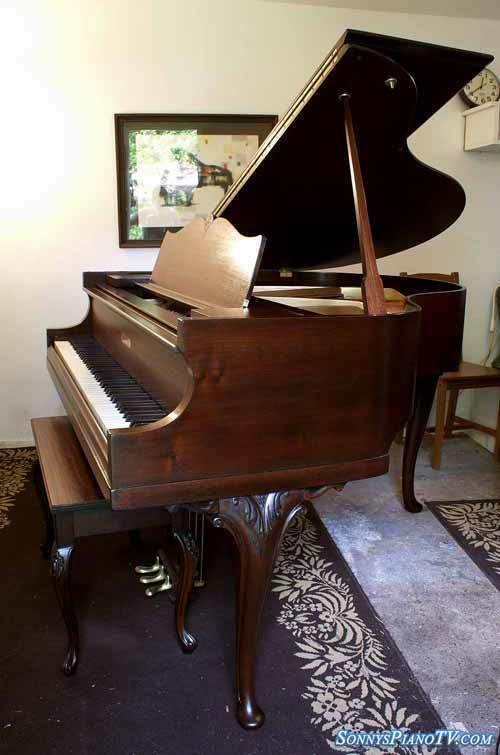 Gorgeous Cherry Mahogany Player Piano Baby Grand 4’8″ Kohler & Campbell about 8 years old. Comes with QRS Pianomation System and disks. Beautiful grain, excellent inside and out. Our technicians and furniture people went over the piano and system with a fine tooth comb. Everything ready to go. Warranty. Free LI/NYC delivery all else continental USA only $475. Questions? Call Sonny Direct 631 475-8046. Very beautiful case and walnut grain, Great instrument and furniture piece. Our technicians and furniture people go over every piano so they are guaranteed refurbished, healthy and ready to go and to last indefinitely. We give you a 1 year repair warranty on all of our pianos. Our expert Piano Technicians sign off on each piano giving you a check list of the condition of the piano and it’s parts. Free LI/NYC vicinity delivery all else continental USA only $475. Beautiful unique, furniture piece, rich sound, hand crafted American Made Winter Piano, great tone and action response. Our technicians and furniture people go over every piano so they are guaranteed refurbished, healthy and ready to go and to last indefinitely. We give you a 1 year repair warranty on all of our pianos. Our expert Piano Technicians sign off on each piano giving you a check list of the condition of the piano and their parts. Free LI/NYC vicinity delivery all else continental USA only $475.